It isn't how much time you spend somewhere that makes it memorable; it's how you spend the time. Such a fun time catching up with Doug today. After the disaster of yesterday, I had my fears about today, especially as it was starting. We got into the car and I tried to buckle my seatbelt and it was caught. It would not move. There was no way it would make it across the seat and into the buckle with or without a passenger underneath it. Diane took the cover off the mechanism and we discovered that the belt is all twisted inside. There was no way we could untwist it and the metal casing had "do not" and "danger" on it, so we decided not to force the issue. This meant that I would be riding all day with no seatbelt. Amazing, after getting used to the protection of seatbelts, how suddenly vulnerable you can feel. We headed north, me without my seatbelt on. As we approached Everett, we hit a parking lot. 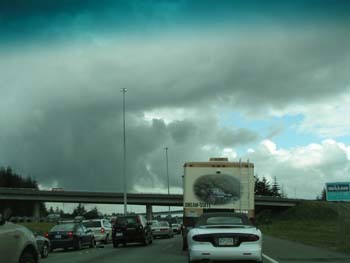 Traffic was moving at about 2 miles per hour as far as the eye could see and we were driving under the biggest blackest cloud I'd seen in a long time. This did not bode well for a successful day. We did one thing differently this year. 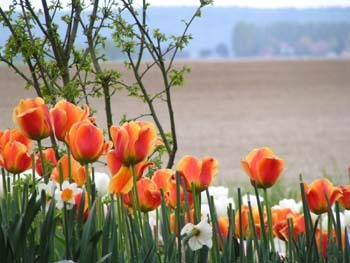 In previous years, we have come up and just went by instinct to find the tulip fields. I think yesterday's entry proves how good my directional instincts are. The previous two years would seem to indicate that, at least when driving in Skagit Valley, Diane's aren't that much better. This time we decided to be prepared. I checked the internet and downloaded not one, not two, but three maps for the tulip festival. For the first time in three years we actually knew which exit we wanted and what we should do after we got off the freeway. And it only took us three years to learn! 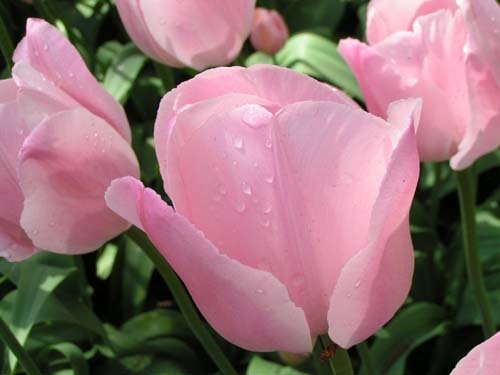 By this time, Doug had called us on the cell phone to let us know they were on their way as well, and we made arrangements to rendezvous at Roozengaarde, the fanciest of the tulip places. But things weren't looking good. We were late in the season, Washington had had unseasonably warm weather, and the tulips had bloomed early. Already most of the fields had been ploughed under. The tulips that were left were few and far between. I was so disappointed. The whole point of this trip was to show my mother the tulip fields, and now it appeared that while she would get to see tulip displays, she would not have the experience of the solid masses of color that has brought me back to Washington several years in a row. Diane and I got to Roozengaarde about 15 minutes before Doug and the old ladies (just put that in to give a hard time to my mother, who will still be "young" if she lives to 100) arrived. He continued to call me with reports of where they were and where we were. My cell phone got more action today than it's had in the whole two years I've owned it! Diane and I took pictures of tulips outside the place while we waited for the others to arrive. Finally we were all assembled at the entrance and walked into Roozengaarde. My mother and Betty made the appropriate ooohs and aaahs as we walked around. Then we rounded a bend and looked off in the distance, and -- there it was: a field of tulips. It was breathtaking. It was everything I wanted to show my mother. It wasn't a whole valley full of tulips, but you definitely got the idea. 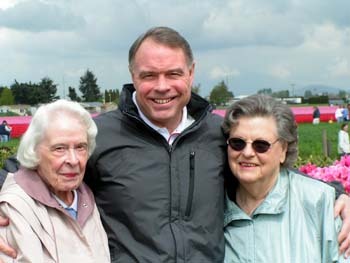 I think both she and Betty were suitably impressed. 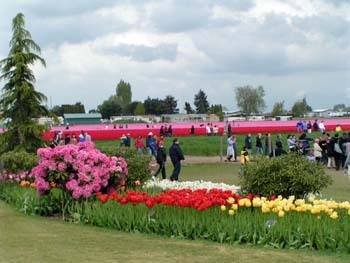 We spent a lot of time wandering around the fields, the gardens, and the gift shop(s) and finally got tulip-ed out. But what started out inauspiciously had turned into a lovely experience. The sun was even out so everything just vibrated in the sunlight. We drove from Roozengaarde to the small artsy fartsy town of LaConner, where we had lunch at a nice little place on the shore line (I'm not sure what it was the shore of, but there was water, anyway!). Then we said our goodbyes. The others headed back to Maple Valley while Diane and I wandered through the shops for a bit and then came back home again ourselves. We're both exhausted, but it was such a fun day. I had feared that the whole day would be a big disappointment, though my mother would never have known it. But the day was saved by the tulip field of Roozegaarde and it was really a very special thing to be able to share with her.